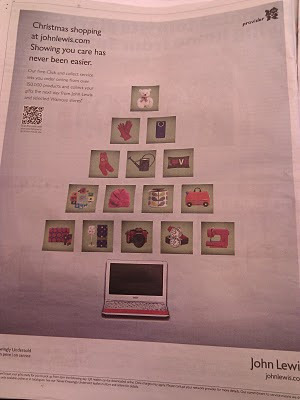 The latest advertiser to use a QR code is John Lewis, who have today added a QR code to their Christmas shopping newspaper ad in Metro. 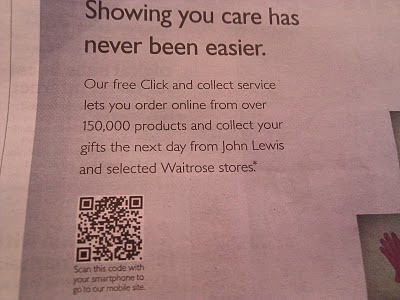 The John Lewis ad explains what the QR code is ('scan this code with your smartphone to go to our mobile site') and the small print at the bottom of the page states 'QR code readers can be downloaded online. Data charges may apply. 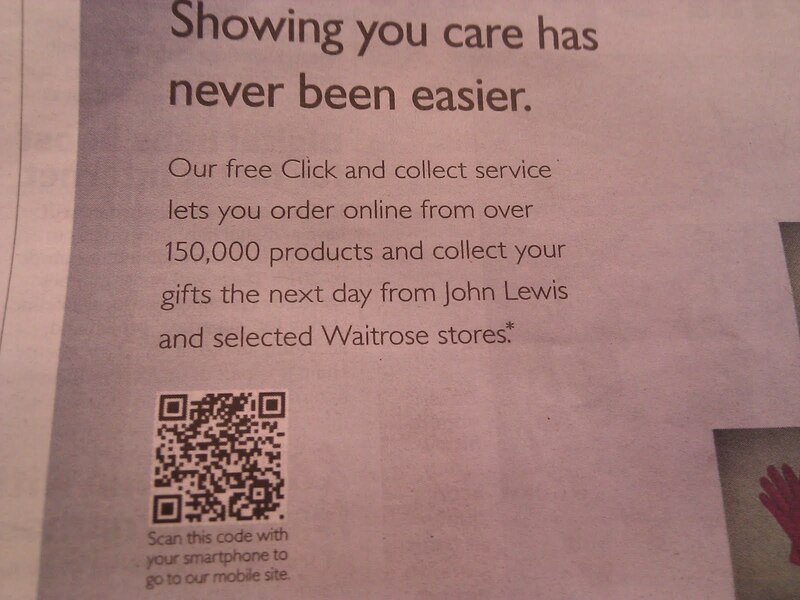 The QR code sends mobile users straight to the desired mobile web page, this could be anything, but in this example John Lewis are sending people to their mobile store. Creative therefore accounts for both the passive and active audiences. The passive audience take all they need to know from the ad itself (Low Involvement John Lewis=Christmas), whereas the active audience are encouraged to either go to the online store or go straight from the ad to the mobile web. In the same way that TV ads are being tagged with 'Search For......' or 'Friend us / Follow Us / Visit Us at Facebook / Twitter / YouTube', the presence of a QR code allows 'traditional' advertising to act as a gateway to a wider digital world. Great examples! QR code usage has been increasing. This is evidence of more offline ads used to send consumers online.